The military and its operations are critical to the security of our country and our people. At BSC, we are proud to partner with the military, and we take our mission in this industry seriously. As the number of military personnel on a base grows, so does the amount of equipment, supplies, gear, weapons, and ammunition that must be kept on the premises. In response to that challenge, we offer a variety of storage and organizational systems that are ideal for military use. Our storage solutions are designed to reduce the burden of asset management and organization and to help achieve the mission through safety and efficiency. Safety increases when weapons and equipment are appropriately stored. When supplies are readily accessible, and weapons and gear are stored safely and ready to deploy, personnel can focus on the importance of training and combat-readiness. We know that our military benefits from spending less time on organizing and tracking gear, and more time on planning and preparation. Military bases and other installations have massive storage and organizational needs. 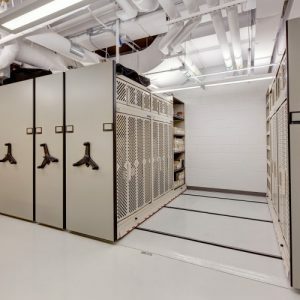 In addition to all of the equipment, weapons, and gear, there are also confidential files and sensitive items, uniforms, personal items, and a wide variety of other types of inventory that need to be stored. Storage solutions are always at a premium, so we offer solutions that maximize efficiency. Many of our regular line of products are ideal for military applications, including structural steel mezzanines, racking, shelving, and high-security and high-density filing systems. These products can be customized in size, configuration, and features to meet exact specifications. We offer weapons cabinets and racks, secure filing systems, and solutions for storing high volumes of equipment. Our ammunition, organizational clothing and individual equipment (OCIE), weapons, and information storage systems are highly customizable and easily configured. Military bases must manage vast amounts of assets. It is of the utmost importance that all equipment and supplies are tracked, inventoried, and easily located. Emergency responses can be hampered when there is incomplete information about the location and condition of assets. 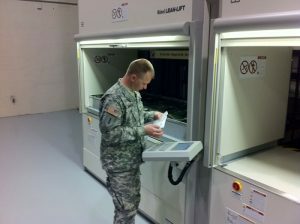 BSC can assist with intelligent management of military assets with RFID and barcode solutions. We can design custom solutions that track access, inventory levels, and the condition of equipment, and also interface with repair or reorder systems. This record of supplies can help ensure gear accountability and prevent loss. Many of our military storage solutions can be customized with different locking systems, including weapons racks and cabinets, shelving and storage rack systems, and filing systems. We offer hinge lock bars, combination and key-and-lock systems, security code or password access, lockable security drawers, locking systems that allow varying levels of access to different personnel, and copy-resistant electronic locking systems. From storage of personal equipment and supplies to storage of high-security items, military storage lockers are a crucial part of any installation’s storage systems. Personnel storage lockers are customizable and include shelving, hangers, and other modular accessories to accommodate clothing, footwear, canteens, helmets, and tactical equipment, and even duffel bags. We offer unique configurations and designs, including systems that minimize the locker’s footprint to maximize available floor space, and others that include a built-in bench. Lockers are constructed of heavy gauge steel and will stand up to challenging conditions. Locks and other security features limit access to only authorized personnel. At deployment time, repacking all supplies and equipment is just not an option. Military installations require storage solutions that can be ready to go and quickly packed into shipping containers. BSC offers easily deployable, space-saving storage solutions for OCIE, weapons and ammunition, and equipment of all types and sizes. The safety of military personnel is paramount. Ensuring that the equipment they need is stored securely is a large part of ensuring their safety. When it comes to the thousands of parachutes that an airborne division has to prepare and store, the lives of personnel are on the line if the equipment fails. Parachutes must be stowed in clean, dry conditions, separate from anything that could cause them to snag and tear or become otherwise damaged. BSC’s parachute storage options protect this critical equipment while keeping the storage space to a minimum. Heavy-duty, portable parachute containers holding a large number of parachutes can be stored on high-density racks, minimizing storage space while maintaining maximum safety. BSC’s military storage solutions are designed with the highest safety and security standards. Organized supplies and equipment combined with asset management technology mean that less time must be spent on inventory control. When equipment is stored safely, and in deployment-ready condition, personnel can be ready to deploy with ease. Maximizing available space means freeing up time for training and preparation. BSC is proud to partner with the military and proud of our solutions that support the military’s critical missions. We look forward to talking about the ways that we can help all branches of the military with our superior organizational and storage systems.